With these Le’Veon Bell Fantasy Football Names you won’t have to sit out a year to get what you’re worth. That’s right – Le’Veon is back and with the New York Jets! Bell’s unique style of running – showing patience for holes to open up and then exploding through them – has helped him enjoy a strong record against opponents. Bell does so many things well including running, receiving and blocking – he’s truly an all-purpose back. A Michigan State Spartan in college, he was drafted by the Pittsburgh Steelers in the second round. 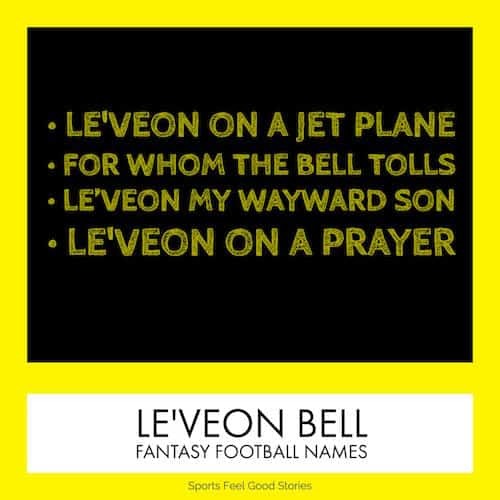 Enjoy these Le’Veon Bell fantasy football names. Le’Veon on a Jet Plane. What tattoo does Le’Veon Bell have on his left arm? He has John 3:15 with the words “That whosoever believeth in him should not perish, but have eternal life.” On his other arm, he has Jeremiah 1:5. Check out all of the Jets’ names! • Bell holds the Pittsburgh Steelers record for most yards rushing on a Monday Night Football game with 204 yards rushed against the Titans. He also holds the Steelers overall rushing record for a game with 236 yards. • He played with quarterback Kirk Cousins, now the QB of the Washington Redskins, on the Michigan State Spartans football team. • He’s the first player to ever rush for 220 rushing yards, gain 60 receiving yards and score at least three touchdowns. Bell had 298 all purpose yards in one game. Not a bad day’s work. Check out #26 on Facebook.